This particular pair of swap figures is called "Marvel Heroes," which is almost painfully generic. Compare that to things like Marvel's Madames or Conquering Heroes or Warriors of the Mind or Avenging Allies or Maidens of Might or Fierce Fighters or Spawn of Symbiotes or Skyline Sirens or Deadliest Foes or any of the myriad other pairs we've had before, and this is just sad. Doctor Strange can astral project and Vision can go intangible, right? "Untouchable Avengers." "Spirited Heroes." I know there isn't a huge overlap between magic and robots, but someone had to have suggested something better than "Marvel Heroes" during the design meetings. This figure is the same mold as the Book of Vishanti Dr. Strange, just done in color instead of semi-translucent blue. The head would be good for almost any version of Dr. Strange - short black hair, combed back, with gray temples? That's him all right! He has a big handlebar mustache, which is a modern convention, but he's still recognizable. The reason he has his modern facial hair is that this is a modern Dr. Strange. Well, modern-ish. This outfit was designed by Terry Dodson and first appeared in 2011's Defenders series. This was after Stephen was no longer Sorcerer Supreme, so for a while he'd just been wearing turtlenecks and khakis - this was a return to a costume. He's wearing mostly black, though it's hard to tell what the items of clothing are supposed to be. The comic art makes it look like a coat with a long tail in the back, but possibly that's a short coat and the "tails" are part of his belt? Who can tell? The toy is based on Hasbro's "small" body, though the torso is new (smooth cloth, instead of visible muscles) and the forearms are lumpy, to represent the odd gauntlets he wore at the time (though their texture was more often shown as a coloring effect, rather than being drawn). 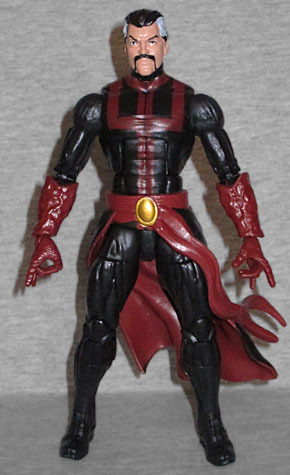 He has a trident symbol painted on his chest, and props to Hasbro for painting the lining of his skirt dark red, while leaving the exterior black. The gold on his belt buckle gets a little off-target, but not too badly. His hands are molded in the famous ILY casting pose, and he gets semi-translucent green versions of Scarlet Witch's hox bolts - just like we predicted would happen, before this figure was announced! 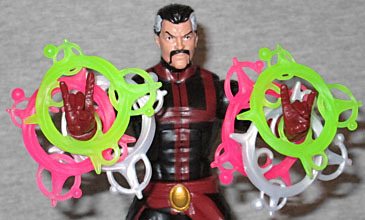 In fact, if you have Scarlet Witch and the Book of Vishanti set, you could jam all the colors of magic onto Dr. Strange's arms, like he's really putting on some kind of crazy light show! Of course Dr. Strange comes with a piece of the Hulkbuster BAF, the left leg. It's massively weighty, and really suggests that the final figure is going to be a gigantic beast of a thing! This Dr. Strange costume survived relatively unchanged when Marvel NOW! kicked off - the only difference was that Stephen became Sorcerer Supreme again, so he regained the Cloak of Levitation. If you have the ML9 figure, you could steal the cape from that and drop it over here. Dr. 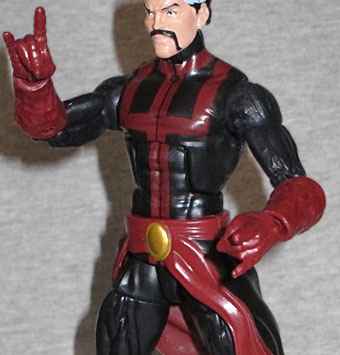 Strange is going to be back to a more traditional design if Secret Wars ever ends, but this remains an interesting look for the character, translated well to plastic.